There's a Boston Market not far from Panda's dance studio, and what's great is you can go to the Boston Market Website and order ahead of time, and it will be there waiting for you when you arrive for pick-up. It's a beautiful thing. I always get a second chicken because I like to have it around for lunch the next day (or breakfast, but I'm weird that way). But with one thing and another and a four-hour training class, I didn't nibble at it much so I had a lot to use for dinner. But what exactly to do with it? OK. OK. There's another box in the freezer. How long does it take to defrost? 40 minutes. 40 minutes...OK, I can wait 40 minutes. I really want to make this. It's gonna be great. I stop and think about chicken pot pie. Think about putting individual, pastry-topped bowls in front of each kid. What are they going to do. Really. I know my spawn. They're going to peel off the pastry, sniff and pick at it, and not eat it. Who am I kidding? I put the box back in the freezer. I will make chicken pot pie without the pie. salt, pepper, 1/4 tsp each dried thyme and dried rosemary, or one small sprig of each, fresh. Heat olive oil in a skillet over medium heat. Saute onion, garlic, carrots and celery about 5 minutes until tender. Add 1 cup of the chicken stock. In a small bowl, whisk the cornstarch with the remaining 1/4 cup of broth until smooth, then whisk in the yogurt. Add mixture to skillet and combine with veggies. Bring to a simmer. Add chicken, salt and pepper, rosemary and thyme. Cover, lower heat, and simmer for 20 minutes. 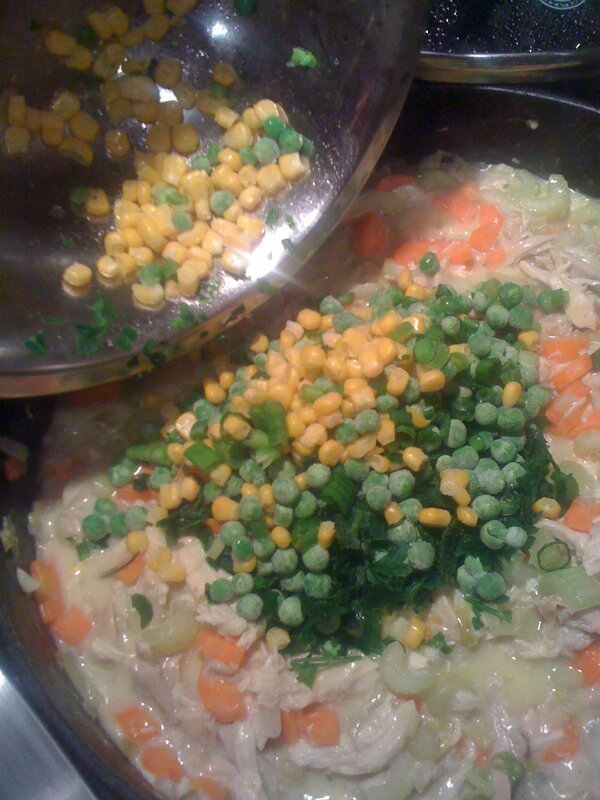 Add corn, peas and parsley and stir. At this point, if you were making pot pie, you'd put the chicken and vegetables into small bowls or a pie plate, and cover with the puff pastry and bake. I made fusili and served it over that. "Oh look," said Jeeps. "Chicken fricassee."